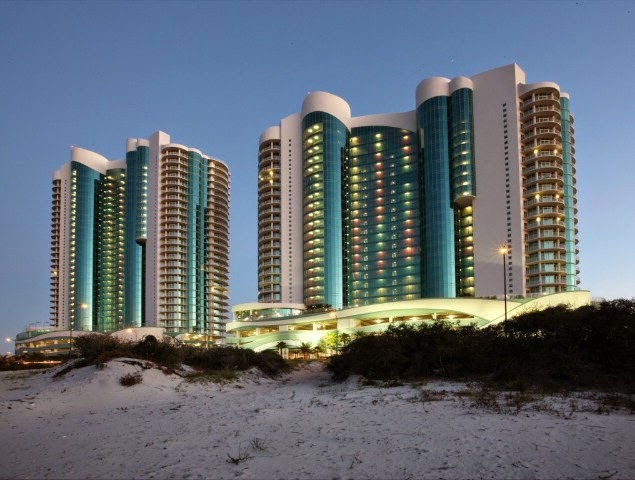 Turquoise Place Condominium, with two towering glass towers, is the premier beach resort in Orange Beach Alabama, the property overlooks the beautiful the sugar-white beaches of the Gulf of Mexico. These popular vacation resort homes on the Alabama Gulf Coast offers outstanding views and accommodations with first-class amenities. Every vacation home at Turquoise Place Condominium features beachfront balconies, with outdoor grills and hot tubs included on each balcony. The luxurious beach homes are available in 3, 4, & 5 BR's and sleep up to 18 people. A family oriented beach resort, Turquoise Place vacation homes are the perfect place to spend a family vacation and make memories that will last a lifetime. Centrally located in Orange Beach Alabama, these resort condos are convenient to some of the freshest gulf seafood available, championship golf courses, world-class deep-sea fishing, the Alabama Gulf Coast Zoo, outdoors trails for hiking/biking, amusement parks, an outlet mall, fresh seafood, etc., etc. Come experience Gulf Coast living at Turquoise Place Condos in Orange Beach AL.